The intersection of Broad Street and Market Street. The founders started their village where Broad and Market Streets now cross. Coming from four towns in Connecticut those from each town took a corner from which to start laying out their home lots. Already the men from Milford and the few who had come with them or who soon joined them, from New Haven and Guilford, in 1666 and early in 1667, had begun to group themselves about the southeast, southwest and northeast corners of what are now Market and Broad Streets, at the never to be forgotten "Four Corners"; thus laying the foundation, as it were, for the custom which has, after two hundred and fifty years, made it seemingly impossible for the city to divorce itself from the belief that it can have but one central and focal point, right there where the first two of the four original highways cross. However, the market era had served to develop the neighborhood of Market and Broad Streets as a business centre. For a little before the War for Independence much of the town's business had been done where the Mill Brook crossed Broad Street, at the junction of Broad and Belleville Avenue. The bridge at Bridge Street diverted much business from the Mill Brook section. The opening of the turnpikes from the western terminus of Market Street proved another powerful influence to focus business at and near the Four Corners. The stage coach traffic also served to leave the uptown centre out of the running. The only inn north of Market and Broad Streets, after Gifford's Tavern, was that at Bridge Street. From 1790 the supremacy of the Four Corners was established. By 1800, both sides of Broad Street, from what is now Canal Street to William Street, were quite closely built upon with two or two and one half story frame buildings for the most part, and now and then a little one story structure in which some citizen plied his trade or kept his store and lived in the rear. There were stores for the sale of general merchandise on three of the Four Corners in 1800, Gifford's tavern occupying the other. South of William Street and north of Canal Street the intervals between the buildings, most of them residences, became wider. Orchards filled generous spaces to the rear and often on either side. A block or so east and west there were small farms with only an occasional farmhouse here and there. The four corners dates back to the earliest days of the settlement. Here today is the heart of the shopping district, and here also are clustered a majority of the theatres and photoplay houses. These four corners have numerous historic and literary associations. At the northeast corner stands the new sixteen-story Firemen's Insurance Building. Note above the entrance "Fireman No. 2," a life size statue of a fire chief in uniform, trumpet in hand (erected 1910' Paul Wiehle, sculptor). "Fireman No. 1" was a wooden figure which for 32 years stood on the roof of the old building. On the south, or Market Street facade of the same building is a bronze tablet erected by the New Jersey Branch of the Sons of the Revolution, marking the route taken by Washington on his way from Philadelphia to Cambridge. 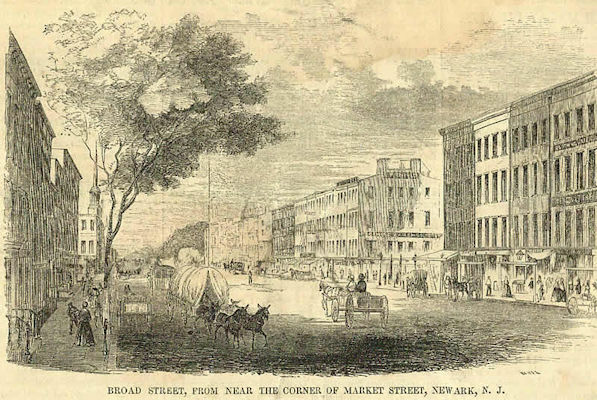 Opposite on the southeast corner of Broad and Market Streets, is the Kinney Building, occupying the site of the Newark Daily Advertiser (now the Newark Evening Star), long owned and edited by William Burnet Kinney, who on his death in 1881 was succeeded by his son, the late Thomas T. Kinney. The Daily Advertiser was edited for a tie by Noah Brooks, and its staff included at various times, the Gilders and Stephen Crane, the novelist. On the opposite corner was the office of the Morning Register, edited by Richard Watson Gilder, and later by Dr. English. The Kinney Building has on its Broad Street facade a bronze memorial tablet, marking the site of the home of Robert Treat, "the dominant spirit in the settlement of Newark, 1666."